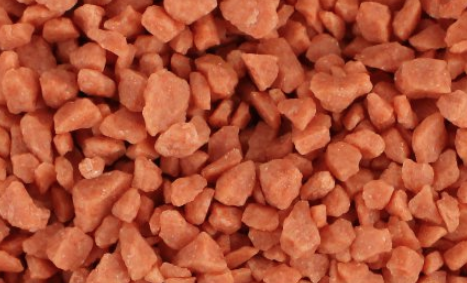 In 2017 Saskatchewan solidified its role as the world’s leading potash jurisdiction by producing a record 20.3 million tonnes (Mt) potassium chloride (KCl). The past couple of years have brought significant changes to the Saskatchewan potash production landscape, from the opening of the province’s first new potash mine in nearly 50 years, to the merger of two North American fertilizer giants, as well as other large-scale acquisitions. In the spring of 2017, K+S Potash Canada Inc. commissioned the Bethune solution mine, the province’s first new potash operation in decades. The $4.1B operation was expected to reach two Mt production capacity by the end of 2017. At the start of 2018, Potash Corporation of Saskatchewan and Agrium Inc. finalized a business combination, billed as a merger of equals, which created Nutrien Ltd., one of the world’s largest crop nutrient providers, worth an estimated US$36 B, with 1,500 farm retail centres and nearly 20,000 employees in 14 countries. In January, The Mosaic Company (Mosaic) announced it had completed an acquisition of Vale Fertilizantes, effectively doubling the size of the company’s global workforce. The acquisition included four fertilizer pro-duction facilities, five phosphate mines and a potash mine in Brazil. 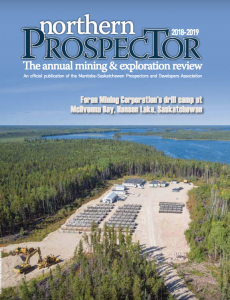 Mosaic also acquired control of the Kronau solution mining project southeast of Regina. The record 20.3 Mt KCl produced in the province in 2017 had an estimated sales value of $4.8B, compared to 17.9 Mt KCl valued at $4.2B in 2016, and 18.2 Mt KCl valued at $6.1B in 2015. Sales volumes thus far in 2018 have remained robust and are expected to meet or exceed the record levels of 2017, while the average realized sales price for muriate of potash has shown continued modest growth. It is estimated that just over $1B has been spent on potash exploration and development projects across Saskatchewan in the past decade. It’s anticipated that approximately $35M will be spent in 2018 on a number of projects that range from exploration to pre-development. In April, BHP Billiton Canada Inc. (BHP) announced that the shaft sinking at the Jansen site had reached the target Prairie Evaporite Formation, 924 metres below ground level. BHP vice-president of Potash Operations, Giles Hellyer, noted in an August interview with The Northern Miner that although the company remains confident in the long-term fundamentals of the potash market, there was no solid timeline for a board decision on the massive underground mining project. He also noted the company may be receptive to taking on a partner to mitigate the financial risk of the project. BHP has already invested nearly US$4B into the project, working on shafts and associated infra-structure. Should the mine proceed in its currently planned form, it would rep-resent one of the single largest corporate investments in the province’s history. Yancoal Canada Resources Co. Ltd. (Yancoal) continues to move forward with its Southey solution mining project, about 60 kilometres north of Regina. Yancoal has received provincial approval of its Environ-mental Impact Assessment and completed a full feasibility study. The company is now awaiting a final investment decision by Yancoal’s Board of Directors on the 2.8 Mt per year solution mine project. Western Potash Corp. (Western) announced in May that its board had approved a three-phase development plan for the company’s Milestone Potash solution mining project. The initial phase of the pilot operation would be capable of producing 146,000 tonnes of granular KCl product annually. The company plans to utilize a selective horizontal solution mining approach with crystal pond recovery techniques. If the pilot operation is successful, Phases II and III could be implemented, adding an additional 1.4 Mt of capacity each. Western has a signed letter of intent with a Chinese policy bank for a $60M credit to finance Phase I, which the company believes will be completed by early 2019. CanPacific Potash (CanPacific), a Saskatoon-based joint venture between North Atlantic Potash Inc. (a subsidiary of JSC Acron) and Rio Tinto Potash Management Inc. (a subsidiary of Rio Tinto plc. ), has continued to advance its Albany solution mining project located southeast of Regina. CanPacific has completed exploration work, submitted an Environmental Impact Statement to the Saskatchewan Ministry of Environment, and is engaging with local stakeholders and members of the public. The company is proposing to build a three Mt per year solution mine near the town of Sedley, with construction slated to start in 2020 and initial production anticipated in 2024. Encanto Potash Corp. (Encanto) signed an agreement with GEM Investments America, LLC and GEM Yield LLC SCS, which could provide $100M in funding over the next three years. Encanto is working in partnership with the Muskowekwan First Nation in an attempt to build the province’s first mine entirely on treaty land. The partners are exploring options for funding via Indigenous Ser-vices Canada and other federal avenues. Other companies such as Karnalyte Resources Inc. (Wynyard project), Gen-source Potash Corp. (Vanguard project) and Canada Golden Fortune Potash Corp. (Broadview project) continue to evaluate the feasibility of their projects while exploring options for financing. Although exploration for industrial mineral deposit types in 2018 was quiet, there was significant production. There are four current salt operations, three as byproduct from potash production and one primary producer. K+S Windsor Salt Ltd. produces byproduct salt at Belle Plaine in south-central Saskatchewan. Compass Minerals Canada Corp. mines primary salt at the Unity solution operation in west-central Saskatchewan. NSC Minerals produces byproduct salt at Rocanville and Vanscoy. ERCO Worldwide processes value-added chlorine-alkali chemicals from salt at its Saskatoon operation. Saskatchewan Mining and Minerals Inc.’s long-standing operation at Chaplin in south-central Saskatchewan remains the only primary sodium sulfate producer in the province. Sodium sulfate is used in a variety of products, including deter-gents, textiles and carpet deodorizers. In addition, Compass Minerals Wynyard Inc. produces value-added potassium sulfate, which is mainly used in specialty fertilizers. Westmoreland Coal Company (Westmoreland) acquired the Boundary Dam, Bienfait and Poplar River coal mines in southern Saskatchewan in 2014 from Prairie Mines & Royalty Ltd. Since acquiring the Saskatchewan operations, Westmoreland has signed new, long-term sup-ply agreements with Crown Corporation SaskPower, and announced it was amalgamating the Bienfait and Boundary Dam mines of southeastern Saskatchewan into one operation, named the Estevan mine. These operations produce approximately 10 Mt of lignite per year, primarily to feed the province’s power stations. Saskatchewan also produced a number of industrial mineral commodities that have varied uses. Canadian Clay Products Inc. excavates and processes bentonite at an operation near Wilcox, about 41 kilometres south of Regina. Colored Shale Products Inc. mines clinker, a stony product formed from naturally coal-fired clay, from quarries near Willow Bunch, roughly 190 kilometres southwest of Regina, on an ‘as-needed’ basis for use as landscaping material. Plainsman Clays Ltd. excavates kaolin clay from two quarries located near the hamlet of Ravenscrag in the French-man River valley in the far southwest corner of the province. The kaolin is excavated in the summer and is mainly sold to the stoneware and pottery markets. Premier Tech Horticulture Ltd. excavates horticultural peat from bogs in the Carrot River region of east-central Saskatchewan and processes it at a plant near the town. They are developing the new Smokey Ridge Bog that lies 21 kilometres northeast of the town of Hudson Bay. Two other companies, Berger Peat Moss Ltd. and Sunterra Horticulture Inc., are also actively exploring for horticultural peat in the central part of the province. 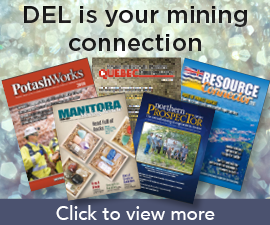 Wapa Bay Resources produces leonardite on a campaign basis from a small quarry near Wapawekka Lake in northern Saskatchewan. Leonardite is used as an organic soil additive and fertilizer. Weil Group Resources, LLC opened a helium processing plant near Mankota in southwest Saskatchewan in August 2016, with planned production of 40 million cubic feet (cu. ft.) of helium per year. Since 2013, North American Helium has acquired helium rights to 1.2 million acres (485,600 hectares) in southwest Saskatchewan. At their Battle Creek project in the extreme southwest corner of the province they drilled three successful holes in the first six months of the year in previously untested targets. To date they have raised $35M and have plans to begin building a production plant in the fourth quarter of this year. The plant will produce at least 50 million cu. ft. of helium per year after coming online in the first quarter of 2020.